Distance from the Liberty Stadium: 191 miles ~ 4 hours 10 minutes. The North Stand behind the goal holds up to 4,800 away fans giving loads of leg room and excellent views of the pitch. To the left is the singing contingent of Wigan fans, aided by a drummer. In this part of the world, they make the best meat and potato pies, other pies and hot dogs are on sale. Wigan is half way between Liverpool and Manchester. You could visit either of these or see more of Wigan itself. A guided evening tour (min 15 people) of Allgates Brewery (WN1 1JU) is available Monday to Saturday and Sunday by arrangement at £12. This includes a beer on arrival and sandwiches or pizza is available from Friday to Sunday or a pie and pea supper from Monday to Thursday. Haigh Hall and Country Park (WN1 1N) is a Georgian Hall set in 250 acres of woodlands. It has country trails, a 15-inch gauge railway, a model village, children’s rides, crazy golf, high ropes, walled gardens, and stables centre with a café, information centre, craft gallery and its own brewery. Wigan’s heritage is told in the newly opened Museum of Wigan Life in the old reference library (WN1 1NU), which was used by George Orwell when researching ‘The Road to Wigan Pier’. The Museum recounts Roman settlements, Civil War battles, industrial heritage and local social history. The Leeds to Liverpool Canal is the longest canal of its type and connects most of Wigan’s attractions such as Haigh Hall, the town centre, Wigan Pier, Pennington Flash. The tow paths are ideal for walking, cycling and exploring Wigan’s industrial and natural heritage. Located at Wigan Pier (WN1 1BA), The Trencherfield Mill Engine at 2,500 horse power is thought to be the world’s largest working mill steam engine. It’s regularly steamed and is free for visitors every Sunday (11am-11.45am and 1pm-1.45pm). you can watch a demonstration, learn of the engine’s past. Nearby hotels include the Holiday Inn Express (WN5 0LX) 1.1 miles away, The Charles Dickens (WN1 2AD), Mercure Wigan Oak and the Fifteens of Swinley (WN1 2AD) all 1.5 miles away and the Premier Inn (WN1 1BL) 1.8 miles away. The stadium has a large bar for away fans. It serves food and drink, and has large screens showing Sky Sports. The traditional pub for away fans is the Red Robin (WN5 0UJ), opposite the cinema complex, 0.2 miles away. ‘The Douglas Bank’ (WN6 7NF) serves cheap beer and 0.5 miles away. The town centre has a Wetherspoons, The Moon Under Water (WN1 1PE) and is 1.2 miles away. The Anvil (WN1 1HE), is near the bus station and 1.2 miles away. It has six hand pulls plus Fosters, Stella & Carling, Hydes Black, All Gates’ Mild, Guinness, Strongbow and Gwynt Y Ddraig. The Berkeley (WN1 1LD) is near the train station at 1.2 miles away and is a fair sized pub having real ales and Sky TV on a huge screen. There’s a Pizza Hut, Burger King, Frankie & Bennys on the retail park near the ground. here’s a large car park at the stadium, behind the away end, (£5 cars, £10 minibuses). but expect delays getting out of the car park after the game. The nearby retail park is only 2 hours parking, over that and you may get a parking ticket. You can also choose from a small selection of private car parking spaces near the DW Stadium – including on-street parking, off-street car parks and around 6 reservable parking spaces from just £4.00 per day. 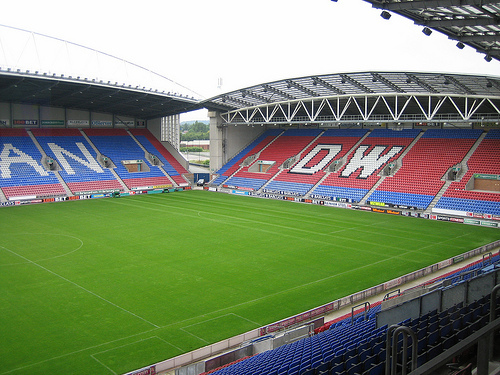 Wigan’s railway stations (Wigan North Western & Wallgate) are both 1.4 miles and a 20-minute walk to the ground; taxis and buses are available. The 621 bus between the two stations drops off outside the Red Robin pub. The 600 bus is more frequent and runs to Robin Park roundabout, a 10-minute walk to the stadium. Trains leave Swansea for Wigan North Western at 09:55, 10:55, 11:55 and 12:54 for the 5-hour journey. There are no trains back after the game.